Derby County boss Frank Lampard feels the recent international break will benefit his side’s energy levels in the coming weeks. The Rams return to acton when they travel to Sheffield Wednesday on Saturday. And Lampard believes his players are now fully rested and raring to go. He told the club’s official website: “The three international breaks have had their positives in terms of the rests and they break the season up so it’s a good time for us to get our heads down and look at the big picture. “I don’t mind game after game and we will work hard to make the best of the big patch we have ahead of us. “The positives out of this break is that we’ve had a rest, got some training in and we have to be prepared for Saturday. 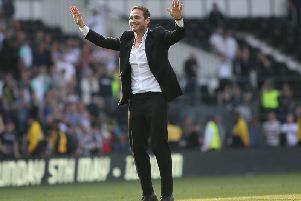 Following Saturday’s game against the Owls, Lampard’s side travel to the Bet365 Stadium to face Stoke City before Swansea City make the trip to Pride Park Stadium. But Lampard feels his side are now in a good place to cope with three games a week. “Three in the week worked for us last month,” he admitted. “We played regularly, we were in good form, we just ticked over in between games and we were getting good results.